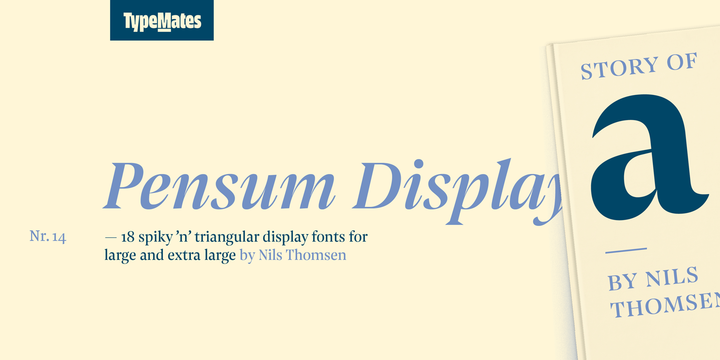 Pensum Display is a contemporary typeface created by Nils Thomsen and published by TypeMates which is the spiky and triangular version of sharp & soft Pensum Pro. It is available in 9 weights (from Thin to XBold) and italics, over 800 glyphs, a wide range of Open Type features and language support. It including various figures such as tabular, lining, small cap, numerator, donominator and lots of fractions. It is suitable for display, headline, typography use. Is a typeface for fashionable and editorial magazine. It offers dynamism to short text in poster, title etc. Enjoy! Price: starting from $59,00 for one font to $359,00 for all 18 fonts. A font description published on Tuesday, October 17th, 2017 in Fonts, TypeMates by Alexandra that has 1,798 views.